La primavera astronomica risentirà di un nuovo forte disturbo mareale intorno il 18 di Aprile. La ricerca scientifica sul Tides e la sua influenza sul flusso troposferico sta proseguendo spedita all’estero, nonostante l’immobilismo delle comunità scientifiche nazionali, confermando la forte sensibilità dell’estero alla ricerca specie se con elevate potenzialità innovative in campo meteorologico e climatico come l’innovazione del Tides e la sua influenza meteoclimatica. Uscirà a breve un articolo specifico sulla ricerca scientifica in concomitanza della pubblicazione imminente della edizione aggiornata del libro in italiano “Il futuro della terra è scritto nella Luna”, con l’inserimento di importanti approfondimenti e formule scientifiche del fisico e climatologo mondiale Dr. Clive Best con cui collaboro da quasi un anno. Dopo un periodo di intenso lavoro di ricerca torno a parlare con soddisfazione delle conferme ripetute della validità della ricerca scientifica sul Tides e la sua influenza sul flusso troposferico (jet Stream), che ha avuto altre soddisfazioni dalla lettura degli ultimi avvenimenti astronomici e atmosferici del mese passato (Marzo) e di questo inizio di Aprile 2015. Intanto veramente impressionante il crollo della AO index in concomitanza dello strong Tides e l’eclisse del 20 di marzo, palesando la esatta corrispondenza di eventi atmosferici vincolata alla forza mareale. We went ahead in scientific research, experimenting with the physical and mathematical calculations with variations of Tides, getting satisfaction and confirmations ever more rewarding. The objective of this book in the English version, in print and digital in its first draft, is to encourage a wider diffusion of the research, involving foreign users, and to stimulate and intensify the interest and discussions on the web. Roberto Madrigali, a meteoclimatologist supported by a team of authoritative scientists and by a considerable amount of scientific research, says no. And after years research supported by facts but ignored by many in the international scientific community, he sets down in black and white the results and prospects of his work which those who consider the Cartesian doubt the engine of the human knowledge should read with attention. Marotzke & Forster(2015) found that 60 year trends in global surface temperatures are dominated by underlying climate physics. However, the data show that climate models overestimate such 60 year decadel trends after 1940. The recent paper in Nature by Jochem Marotzke & Piers Forster ‘Forcing, feedback and internal variability in global temperature trends’ has gained much attention because it makes the claim that climate models are just fine and do not overstimate warming despite the observed 17 year hiatus since 1998. They attempt to show this by demonstrating that 15y trends in the Hadcrut4 data can be expected in CMIP5 models through quasi random internal variability, whereas any 60y trends are deterministic (anthropogenic). They identify ‘deterministic’ and ‘internal variability’ in the models through a multi-regression analysis with their known forcings as input. where is the forcing, is a climate feedback and is fraction of ocean heat uptake and is random variation. This procedure was criticised by Nic Lewis and generated an endless discussion on Climate Audit and Climate-Lab about whether this procedure made statistical sense. However for the most part I think this is irrelevant as it is an analysis of the difference between models and not observational data. Firstly the assumption that all internal variability is quasi-random is likely wrong. In fact there is clear evidence of a 60y oscillation in the GMST data probably related to the AMO/PDO – see realclimate. In this sense all models are likely wrong because they fail to include this non-random variation. Secondly as I will show below the observed 15y trends in Hadcrut4 are themselves not quasi-random. Thirdly I demonstrate that the observed 60y trends after 1945 are poorly described by the models and that by 1954 essentially all of the models predict higher trends than those observed. This means that the ‘deterministic’ component of all CMIP5 models do indeed overestimate the GMST response from increasing greenhouse gas concentrations. 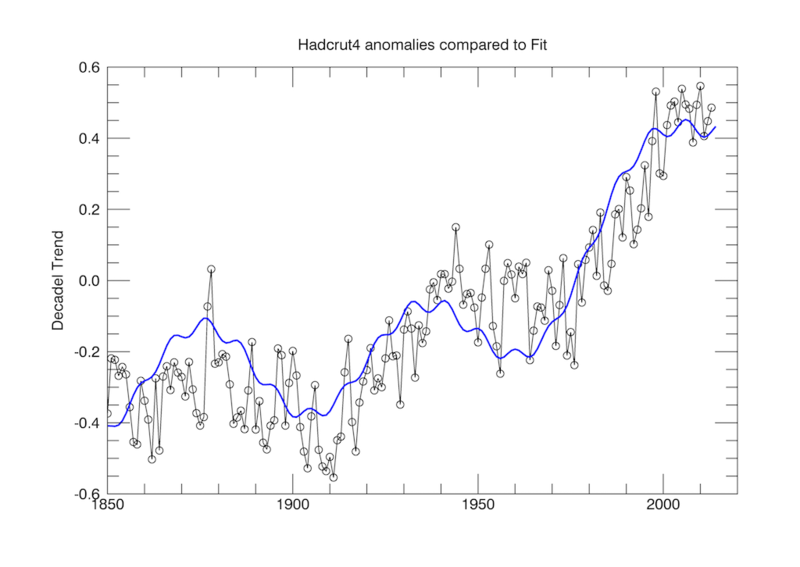 Hadcrut4 anomaly data compared to a fit with a 60y oscillation and an underlying logarithmic anthropogenic term. The physical justification for such a 0.2C oscillation is the observed PDO/AMO which just like ENSO can effect global surface temperatures, but over a longer period. No models currently include any such regular natural oscillations. Instead the albedo effect of aerosols and volcanoes have been tuned to agree with past GMST and follow its undulations. Many others have noted this oscillation in GMST, and even Michael Mann is now proposing that a downturn in the PDO/AMO is responsible for the hiatus. I have repeated the analysis described in M&F. I use linear regression fits over periods of 15y and 60y to the Hadcrut4 data and also to the fitted equation described above. In addition I have downloaded 42 CMIP5 model simulations of monthly surface temperature data from 1860 to 2014, calculated the monthly anomalies and then averaged them over each year. Then for each CMIP5 simulation I calculated the 15y and 60y trends for increasing start year as described in M&F. Figure 2 shows the calculated 15y trends in the H4 dataset compared to trends from the fit. For comparison we first show Fig 2a taken from M&F below. 2013 AR5: “It is extremely likely that human activities caused more than half of the observed increase in GMST from 1951 to 2010. The best estimate of the human-induced contribution to warming is similar to the observed warming over this period.”However is this increased confidence actually justified in view of the fact there has been essentially no surface warming at all since 1998? The AR5 attribution analysis is all based on figure 10.5 shown below and the seemingly small error bar on the Anthropogenic component ANT. Despite the much higher uncertainty in the two individual anthropogenic components GHG and aerosols, the ‘fingerprinting’ analysis can supposedly isolate ANT with a high degree of certainty. This fingerpriniting is extremely obscure and is not at all well explained in the text of chapter 10. Even Science of Doom is not convinced by their arguments. However let’s be generous and assume that they are correct and the error on ANT can indeed be shown to be that small. The real problem they now have is that the probability that ANT and Observed agree depends on the assumption that Internal Variability is 0.0 ± 0.1 C – but we just saw that this is now increasingly unlikely. La ricerca scientifica sulla forza gravitazionale/mareale (Tides) con effetto combinato della Luna e il Sole sulla massa d’aria imponente circumpolare del Jet Stream (flusso troposferico) è sempre più presa in seria considerazione all’estero, con il contributo prestigioso internazionale dal punto di vista scientifico del fisico e climatologo inglese mondiale Dr. Clive Best. Una collaborazione prestigiosa e importantissima, che ha aperto da quasi un anno i confini internazionali a questa nostra ricerca scientifica sul Tides e gli effetti conseguenti sulla corrente a getto circumpolare della libera atmosfera. La ricerca scientifica sulle variazioni del Tides (forza mareale) generata dalla forza gravitazionale risultante Luna>Sole>Terra, viaggia spedita e si sta ulteriormente approfondendo all’estero, dove, quanto prima, uscirà un articolo scientifico in inglese specifico, che sarà pubblicato a livello mondiale. Un imponente fiume d’aria come il flusso troposferico, presente circumpolare a quote medie da 5 a 12 km e con una massa di notevole spessore, non sfugge certo alla legge di gravitazione universale di Newton, e il Tides si conferma la causa principe di ogni modifica di velocità e di direzione del jet Stream nella libera atmosfera. Just how reliable is the IPCC AR5 advice to policy makers? World political leaders are basing policy on the validity of this statement, which is entirely based on comparing CMIP5 models to global surface temperature data. These ‘fingerprinting’ studies are described in chapter 10, which I find all but impossible to comprehend. The underlying assumption in AR5 is that natural climate variability has essentially played no role in warming since 1950. However is this actually true ? Figure 1 shows a comparison between the ensemble of CMIP5 models and observations. Model tuning aims to match observed climate system behaviour and so is connected to judgements as to what constitutes a skilful representation of the Earth’s climate. For instance, maintaining the global mean top of the atmosphere (TOA) energy balance in a simulation of pre-industrial climate is essential to prevent the climate system from drifting to an unrealistic state. The models used in this report almost universally contain adjustments to parameters in their treatment of clouds to fulfil this important constraint of the climate system. So the models are tuned so as to describe past observations. Furthermore periods of cooling are explained by volcanoes which are simulated by something called ‘EMICS’ – Earth System Models of Intermediate Complexity up until 2005. Please don’t ask me what EMICS are but there is also no doubt in my mind that these are also tuned so that aerosols can then match the global temperature response to volcanic erruptions such as Pinatubu! Chapter 10 of the IPCC report fails to highlight the important assumptions in the attribution studies. Chapter 9 of the IPCC report has a section on centennial/millennial natural variability with a “high confidence” conclusion that comes with little evidence and appears to be based on a cursory comparison of the spectral results of the last 1,000 years proxy results with the CMIP5 modeling studies. L’inverno è entrato ufficialmente dal punto di vista astronomico dal 22 Dicembre ma con una situazione atmosferica indubbiamente mite in quota caratterizzata da minime basse giusto per inversioni termiche o massime basse per nebbie persitenti nei fondi valle e pianure interne. Una situazione termica temperata e gradevole per una stagione invernale meteorologica e climatica che stava dando l’illusione di un Inverno che si sarebbe protratto non all’altezza del periodo sia in questo fine 2014 come anche per il 2015. Oramai in rete come nei notiziari televisivi, eravamo bombardati da informazioni climatiche inerenti a temperature fra le più calde del secolo (come sempre catastrofismo puro e gratuito) con profezie di un inverno 2014-15 destinato a soccombere ad una persistenza di aria mite sopramedia con neve destinata a rimanere assente ovunque come sui rilievi, con un periodo Natalizio ipotizzato tutto “in camicia”. What is the worst damage that increased Carbon Dioxide could possibly cause on earth?The answer is surprisingly little (ignoring hypothetical ‘feedbacks’) ! So now let’s imagine the most extreme case possible. What if CO2 levels were somehow to rise 300 times higher than current levels reaching crazy levels like 1%? Just how hot would the earth then get ? So really not so bad after all! The maximum possible CO2 greenhouse effect on earth is about 13 deg. C.
These calculations are based on a line by line ‘radiative transfer’ code covering the dominant 15 micron absorption band described here. So what is the problem of anthropogenic global warming – if any? For 99.9% of earth’s 4 billion year climate history CO2 never has been a problem. On the contrary CO2 has helped to keep the earth’s temperature just right for life to flourish. In reality CO2 is a wonderful stabilising feedback that counteracts external ‘dangerous’ forcings on climate, and will continue to do so as long as life continues to flourish. CO2 levels in the earth’s atmosphere normally react to changes in climate. They naturally regulate atmospheric CO2 by responding to changes in ocean temperature. It is basically only now that CO2 levels have increased before temperature, with the possible exception of the Paleocene–Eocene Thermal Maximum (PETM) event 50 million years ago. Anthropogenic CO2 ‘climate change’ is less than a blink in the eye. Geological evidence shows that during the PETM, CO2 levels rose by about 3 times more than the most pessimistic levels imaginable today, even if humans were to burn all available fossil fuels on earth. Yet during PETM temperatures only rose by just 5C. Furthermore it is entirely possible that the PETM excursion in CO2 levels was not due to some volcanic belch of CO2, but instead was indeed the result of some external astronomical forcing such as a supernova, which CO2 levels then reacted to as a response. So we need to keep things in perspective regarding (catastrophic) anthropogenic climate change. Yes human activity will most likely result in some small warming but its effect will naturally be rather limited. It may even turn out to be a blessing in disguise because increased CO2 levels now may likely delay the onset of the next ice age which otherwise is due to start around now. Another ice age would be orders of magnitude more catastrophic. CO2 greenhouse effect for concentrations up to 0.1 C. Shown are the direct surface temperature responses under ‘business as usual’ policies untileventually fossil fuels are exhauted. Saturation of the narrow CO2 15 micron lines into the Stratosphere ensures that total greenhouse warming is limited to 13C. In arrivo il grande freddo dopo la parentesi Africana sciroccale con differenze di 15° negativi.